On January 5 1757 Louis XV made his way down to an awaiting carriage at 6 o'clock in the evening. The King crossed the Salon of the King's bodyguard accompanied by the Dauphin and the captain of the guard. Just as the King left the room when a man jumped out in front of the sovereign and lashed out against the King. Louis XV immediately touched his right side and found his hand to be bloody. The assassin - a man Robert-François Damiens - had stabbed the King in his right side right between the fourth and fifth rib. The wound was superficial but quite long; the King fainted from the mere shock. When the King regained conciousness he was still in shock and under the impression that he was dying. He quickly called for his priest, handed over the kingdom of France to the Dauphin and desperately begged the Queen for forgiveness if she thought that he had caused her any distress. Robert-François Damiens was quickly taken away by the royal guards since he made no attempt to flee. He was convinced that the murder of the King would bring peace and religious freedom to the kingdom. He had previously worked as an assistant to several members of Parliament who harboured ill feelings against the King and Madame de Pompadour. Robert-François was of a weak character and was strongly affected by these ideas. After he had been captured it was vital for the King's security to find out whether he had any accomplices. Damiens was tortured but revealed no other accomplices. He was sentenced to death and on March 28 1757 he was executed. The execution (for what was considered the worst possible crime) was terrible. Before the execution itself the hand that held the knife was burned with red-hot irons and the like. His arms and legs were then each tied to a horse that was to literally tear him apart. But the method rarely worked and after more than an hour, the executioner had to cut off his arms. The torso was then burnt - it is unknown whether he was still alive. It was not the physical harm that had shock the King - he recovered after eight days - it was the assault itself. 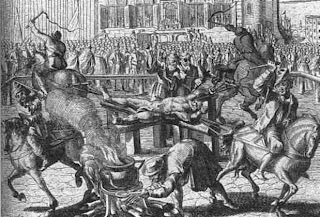 Never before had a King of France been the subject of an assassination attempt and certainly not after the King had become almost sacred in the monarchy. The thought that something like that could happen to the centre of France was terrifying not just to the King but to the court as well. Henri IV was assassinated prior to this attempt.